Bungie and Activision Publishing, Inc., a wholly owned subsidiary of Activision Blizzard, Inc. (NASDAQ: ATVI), deliver the world-renowned, first-person action game, Destiny 2, to players across the globe on PlayStation®4 systems with additional, timed exclusive* content, and Xbox One (PlayStation®Plus or Xbox Live Gold subscription, respectively, required for significant features). On the heels of celebrating the biggest Beta in Bungie and Activision Publishing history, and after receiving nearly 70 global awards and nominations to date, including industry behemoths “Best Multiplayer Game and Best Social/Online Game from gamescom award 2017”, and “Best PC Game – Game Critics Awards: Best of E3 2017,” the stage is set for Destiny 2, the sequel to the internationally acclaimed Destiny, to be one of the biggest launches of the year. Additionally, Destiny 2 will be available on October 24 on PC at retail and as the first non-Blizzard game to be offered digitally via Battle.net, Blizzard Entertainment's online gaming service. Developed by Bungie, Destiny 2 is a highly anticipated sequel that takes players on an epic journey across the universe to defend humanity from annihilation. The game welcomes new players to the universe, as well as those who have been devoted to the universe since the beginning, with an array of modes and activities to explore. In the story of Destiny 2, the last safe city on Earth has fallen and lay in ruins, occupied by a powerful new army. Players must master new abilities and weapons to reunite the city’s forces, stand together and fight back to reclaim their home. "A great story. Awesome characters. A menacing villain. A clear mission. A gorgeous, expansive world to explore. And of course, great, innovative gameplay that is fun to play solo or with friends. Destiny 2 has it all," said Eric Hirshberg, CEO of Activision. 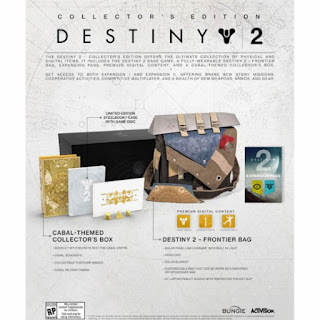 "Whether you're one of the millions of fans who are already a part of this community, or you are brand-new to the Destiny world, this game is something all different kinds of fans will enjoy and appreciate. We can't wait to share it with you." In Destiny 2, every player creates their own character called a “Guardian,” humanity’s chosen protectors. Players can choose from playing the cinematic, story campaign, venturing into the expansive destinations to join in cooperative modes including Strike missions. They can also explore and complete Quests, Adventures and Patrols, or uncover Lost Sectors and Treasure Chests, while rallying with other Guardians to dominate Public and Heroic Events, Flash Points, and more. For competitive players, Destiny 2 offers intense 4v4 multiplayer matches in ‘The Crucible’. Additionally, the fan-favorite endgame gameplay experience, the 6-player Raid, will go live for players at 10 a.m. PDT on Sept. 13. An all-new, community-oriented feature to be implemented in Destiny 2 rolling out shortly after launch is the ‘Guided Games’ system to help players find like-minded groups to experience some of Destiny 2’s most challenging activities. 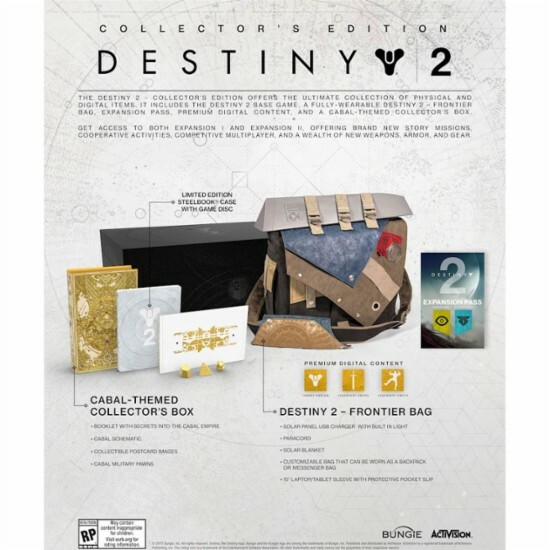 The product line-up also features the Destiny 2 – Game + Expansion Pass Bundle, the Destiny 2 – Digital Deluxe Edition featuring premium digital content at $99.99 SRP, the Limited Edition at $99.99 SRP, and the Collector’s Edition, featuring a fully-wearable Destiny 2 – Frontier Bag, Expansion Pass, premium digital content and a Cabal-themed Collector’s Box. Okay so that is a whole lot of information, let me tell you first hand what I love. I got this game for my oldest son, my youngest is 6 and the game is to advance for him. My oldest though loves it. So you start the game off by making your guy, now you don't make him from scratch but you are able to pick some features and the colors. That way he (or she) is personalized by you. Then you start the game by yourself, when you first start you can't play with anyone else. It really is just you, my son liked this though because he was able to mess around and figured out his moves and features. After you reach a certain location you unlock multi player play. He was then able to play with his friends and unlock even more of the game. I myself am really impressed with the graphics, at one point in time I walked in on the couch and though I was watching a tv show with him, it wasn't until he talked into his headset that I realized it was his game!! So a huge thumbs up not only for the graphics, but also for the epic story line as well.